Turn your backyard into a bird haven with the Gardman Woven Rope Roosting Pockets with Roof. The familiar shape of each of these units adds a charming look to any setting, and this generous set of 25 pockets is great for use as a craft or classroom project. 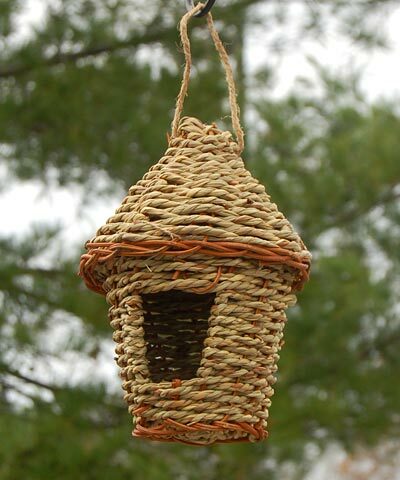 Each woven rope home has a 3" diameter base and stands 7.5" tall, offering songbirds plenty of space. A 1.75" wide and 2" high, rectangular opening allows wrens and chickadees to enter the unit easily, while a 5.25" diameter roof tops each shelter. The rope construction not only adds a natural feel to each item, it also ensures excellent ventilation and drainage. An attached loop hanger atop each piece allows them to hang from a bracket, and the brown tones mesh with your backyard. The generous kit is great for a scouting group or craft party. Help children appreciate nature and offer small birds shelter with these Woven Rope Roosting Pockets with Roof. Note: This case pack includes 25 of the Gardman Woven Rope Roosting Pockets with Roof.